Following is a brief extract from our customer handbook – please download the handbook here as it has full information for customers as well as the relevant paperwork. Customers are responsible for unloading/checking weight of fruit and for uplifting oil, unless prior arrangements have been made for bulk deliveries & collection. TOP records all the relevant processing data – date & time, batch number, fruit variety & weight, oil yield (by weight & %) and any other relevant factors. The key data is then noted on a TOP label that’s affixed to the customer’s container. Any post-processing testing is the customer’s responsibility. Customers are asked to observe all notices and respect all requests from staff, including instructions required under the Health & Safety in Employment Act. 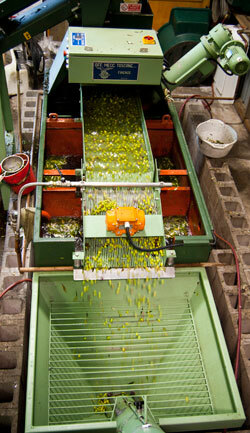 Customers are welcome to stay and observe the olive pressing process if they wish – but from a safe distance. Main hazards include moving conveyor belts, moving forklift, noise and oil fumes when close to malaxing bins – eye and ear protection recommended. Customers are asked to exercise judgment in conversing with staff during processing – distraction can compromise quality and may lead to accidents. Where customers enter the premises for processing purposes (e.g. introducing infusion material) they do so at their own risk and must comply at all times with TOP’s Health & Safety requirements and standards. Please download the full handbook here as it has full information for customers as well as the relevant paperwork. For any further information please contact us.